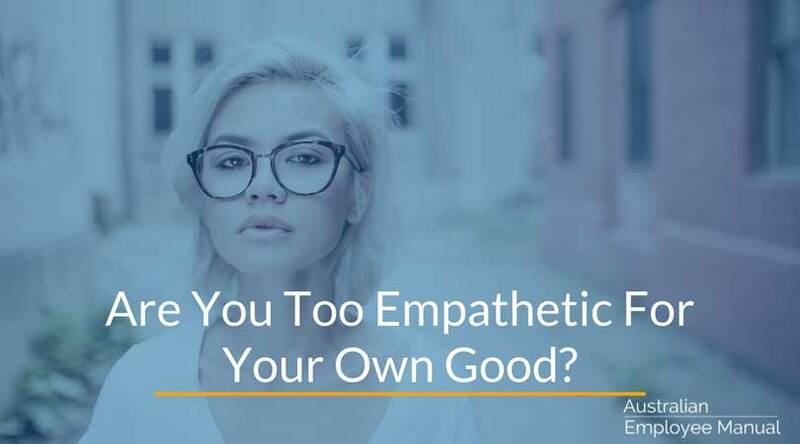 Are You Too Empathetic For Your Own Good? My kids tell me that I am just a big softie. Show me a video of a dog being reunited with its owner who has been serving in Afghanistan, or of a mother’s face when she watches her child take their first steps and I am instantly in a puddle of tears reaching for a tissue. But what causes that response? Empathy. Empathy has two core parts to it – Affective or Emotional Empathy and Cognitive Empathy. Affective Empathy is how you feel in response to someone else’s emotions. Seeing someone experience an emotion triggers sympathy, compassion, anxiety, joy or a whole host of other emotions inside, and these feelings move us to reach out to help someone. Cognitive Empathy is the logical side of the equation. This is where you can correctly identify the emotion that someone else is or may be experiencing, and work out what triggered it. Most people experience both Affective and Cognitive empathy to a greater or lesser degree – you need both to function in a healthy way in society. People with personality disorders such as narcissism, psychopathy or sociopathy only experience Cognitive Empathy. They logically understand what a person is feeling, yet will only reach out to help if doing so will help them. To someone with these disorders, all people are objects and are treated accordingly. They use their understanding of what people are feeling to their own advantage without caring about the people they are dealing with. Brain scans show they don’t feel any automatic emotional response to the person other than irritation if the unseemly display of emotion is interfering with their particular goal or objective. These personality disorders affect between 1.5% – 10% of business leaders, politicians and financiers depending on which research you read, and 15% of prison populations. The people with this disorder, who are not in jail, tend to rise to positions of authority, which makes their disorder all the more dangerous. (My personal view is that anyone who seeks management roles or public office should be screened for these disorders – and if they are affected they should not be promoted, hired or endorsed as a candidate). Why is Balanced Empathy Important To Business? Without a balance affective and cognitive empathy, businesses become hard and cold. The ends always justify the means and woe betides anyone that gets in their way. Leaders that are out of empathy balance see people as simply numbers on a balance sheet, and make decisions about them without any input or consideration about individuals views or the impact the decisions will have on them. These leaders also make decisions based on popular opinion or internal politics to get the maximum personal advantage. Such leaders are often celebrated as being able to take tough decisions, with people who follow a more democratic approach being derided as wimps, or failing to have the ticker for the job. Leaders that have a good balance of both forms of empathy are inclusive, consultative and informative. They openly share information and allow participative decision making to create the best outcomes for all concerned. In governments that are out of empathy balance, public policy is made by manipulating emotional responses in people to generate support for policies that are inhumane or damage the long-term sustainability of our environment. During the Nuremberg trials, one of the judges described the war crimes as a failure of empathy. Recently Matthew Cherian said, Empathy is essential for democracy. We need empathy for an open and honest society. When people suggest that someone is too soft, they often really mean that the person is high in Affective Empathy. These people feel other people’s pain and issues very deeply and personally. Like all parts of our emotional spectrum, this only becomes an issue if the feelings become debilitating or negatively affect your life. If you are triggered by someone’s pain, and then remain in that pain with them, you may not have the emotional resources to help them. You become paralysed and feel helpless and hopeless about the situation. If you are concerned that you are too much an empath, then talk with a trusted counsellor or friend to help you find ways of coming back into balance. Is Too Much Empathy Really An Issue? As Roman Krznaric suggests, I believe that as a society we generally don’t suffer from too much empathy. Rather, we actually suffer from an empathy deficit. We are no longer following the Golden Rule Do unto others as you would have them do unto you, and we celebrate and iconize those without affective empathy in our workplaces, businesses and governments. Imagine the possibilities if we could shift this deficit. If we could bring our society into a more balanced empathetic experience.